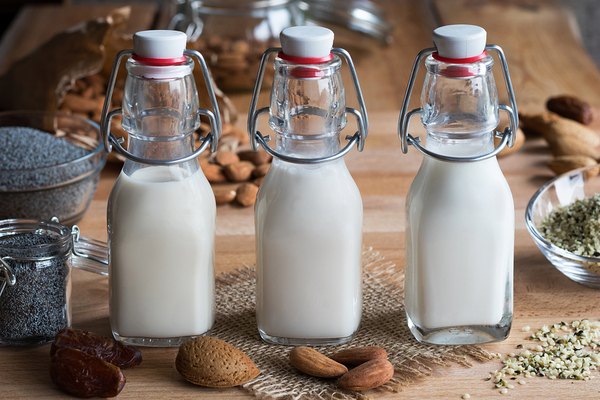 For most people, dairy foods can be part of a healthy, anti-inflammatory diet. However, the USDA's recommendation to consume three cups per day seems excessive in my opinion. For those who can digest it, dairy milk and other dairy products in moderation can be a healthy dietary addition. Around 70% of the world’s population suffers from lactose intolerance, which causes difficulty breaking down the proteins found in cow’s milk. And it's not a surprise considering we are not cows! Yet decades of 20th century declarations about the health of dairy foods persuades many of us to consume dairy when it’s not necessary for our health. Humans are the only mammals that consume milk after weaning. Cow’s milk is packed with growth hormones that are great for feeding calves, but not ideal for humans. Weight gain and possible cancer cell growth are two potential outcomes of excessive dairy consumption. And according to author and doctor, Mark Hyman, people who suffer from digestive problems, type 2 diabetes, PMS, infertility, heavy menstrual periods, skin problems, allergies, and other chronic diseases should avoid eating dairy products. Are there ways to avoid dairy products, yet still have satisfying, tasty substitutes, without skimping on nutrition? Absolutely! Here are my top 5 non-dairy alternatives to yogurt that are well worth trying. CoYo is one of the most delicious yogurt alternatives, and is based on coconut milk. It’s real yogurt, containing probiotic cultures, yet it’s made from coconut milk rather than dairy milk. Smooth, creamy, and healthy, CoYo tastes good enough that it will never cross your mind that you’re “depriving” yourself of dairy-based yogurt. Some yogurt alternatives are nut-based, and Forager’s Cashewgurt is a prime example. It’s made from certified organic, non-GMO, kosher ingredients, and is free from lactose, soy, and gluten. Cashewgurt comes in a range of popular yogurt options, including plain, blueberry, strawberry, lemon, vanilla, cherry, and coconut. 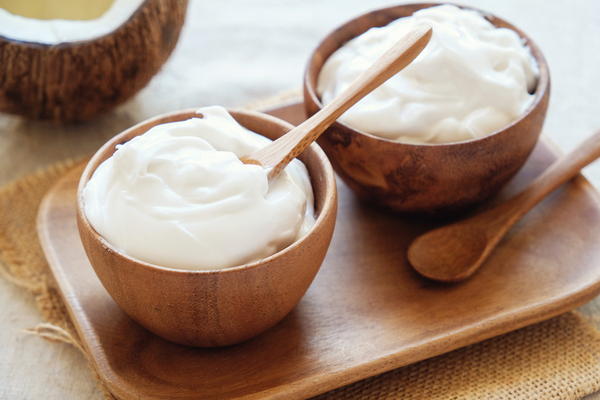 Yogurt alternatives made from coconut, almonds, cashews and other non-dairy products are increasingly popular and make great meal, cooking, and snack choices. Made from almond milk, Kite Hill Yogurt includes the health-promoting active cultures that make yogurt such a terrific part of a healthy eating plan. It is available in plain, key lime, pineapple, strawberry, blueberry, peach, and vanilla, and is available in European style, Greek style, and handy snacking tubes. Anita’s Coconut Yogurt is a coconut milk-based yogurt alternative that is made in New York with no additives. Packed with good fat, probiotics, and flavor, Anita’s is made from pure coconut milk, organic coconut water, and live cultures. It’s made to be versatile for recipe use and comes in plain, mango, and blueberry. So Delicious Dairy Free offers coconut milk yogurt alternatives in a range of flavors. The company participates in a robust allergy testing program and is committed to sustainability, using organic ingredients wherever possible. The entire line of foods is certified vegan and non-GMO. Dairy-free substitutions like yogurt alternatives can be used in your recipes so you can cut down on the use of dairy products in your cooking and baking. Coconut cream can substitute for heavy cream, and firm coconut oil can substitute for butter. And yogurt alternatives can substitute for yogurt without missing a beat. If you are able to digest dairy products, enjoy some dairy on an occasional basis. One recommendation I give to my clients is to use it only as a condiment/flavor enhancer, insted of the main focus of your meal. For the dairy averse, thankfully substitutes are becoming increasingly popular. Many of them have added health benefits and are easier on the environment than production of dairy products. Give these yogurt alternatives a try. See for yourself how easy it is to replace dairy products with delicious, healthy, more-sustainable alternatives that are friendly to your favorite recipes. If you are interested in learning more about nutrition, we invite you to contact us at any time.